Potomac Eagle Scenic Railroad, "Where Eagles Fly!" The Potomac Eagle Scenic Railroad (reporting marks, PESX), based in Romney, West Virginia is a shortline/tourist line that operates a little over 52 miles of an old Baltimore & Ohio Railroad branch line between Green Spring and Petersburg, in the state's eastern panhandle. 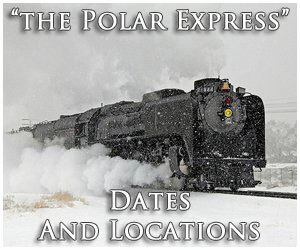 Today, the railroad operates its usual excursion and other specials throughout most of the year. One of the signature features of the Potomac Eagle Scenic Railroad is Bald Eagles, which are commonly seen on every trip. While the eagles may not seem like an important aspect of the trip the railroad actually takes great pride in visitors spotting one as they give information about the bird on their website and also during your trip. Aside from the eagles, the scenery alone through the canyons of the South Branch River make the trip well worth it. Depending on what your interested in trips aboard the Potomac Eagle Scenic Railroad can last from between four hours to all day. 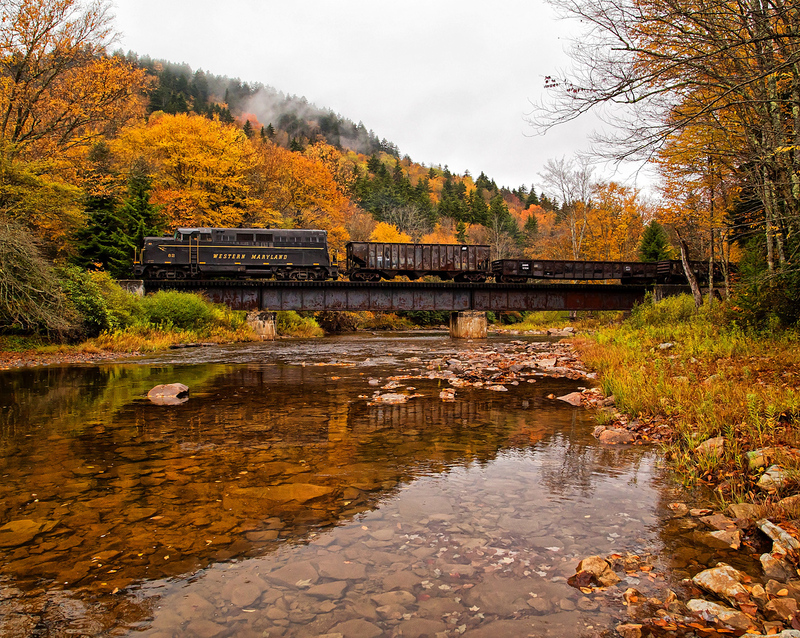 Along with the railroad's daily excursions it also operates special events like the Loy Special, Murder Mystery trains, fall foliage trips (be sure and have your camera! ), and the exclusive all day trips just to name a few. 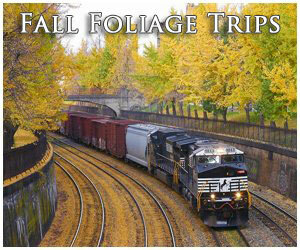 Their trains operate April through November each year with October being the busiest time of the season as folks scramble for tickets aboard the very popular fall foliage trips mentioned above. 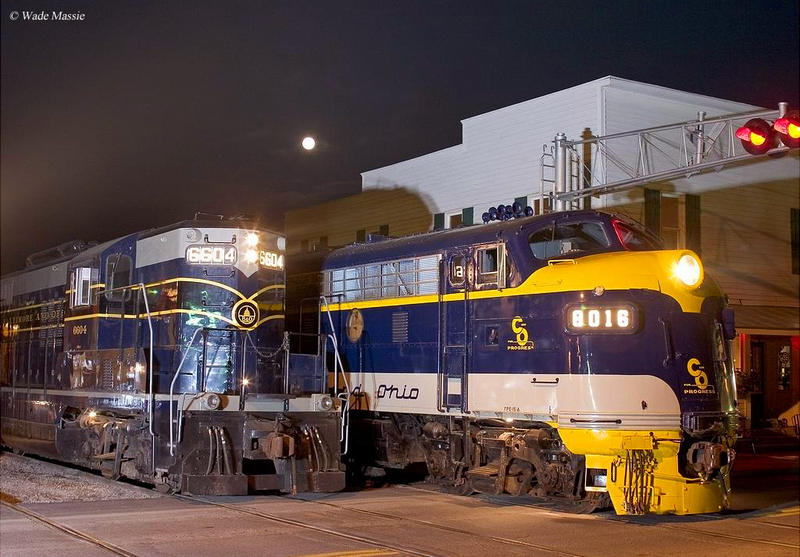 While these trains operate each and every day of October, if you are interested in catching one it might be a good idea to book in advance to be sure that you get a seat. As for a typical excursion trip aboard the Potomac Eagle, you have your choice of accommodation; outdoor, indoor, or ride in style. If you are interested in riding the train outside, which many folks really enjoy (especially during the fall season), you will do so in their converted gondola car that is retrofitted with benches. Indoor riding includes seating in a standard coach or their upscale club and diner cars. Naturally, the club and diner are more expensive when booking your trip. However, they offer comfortable seating and on-board meals allowing for quite the memorable experience! 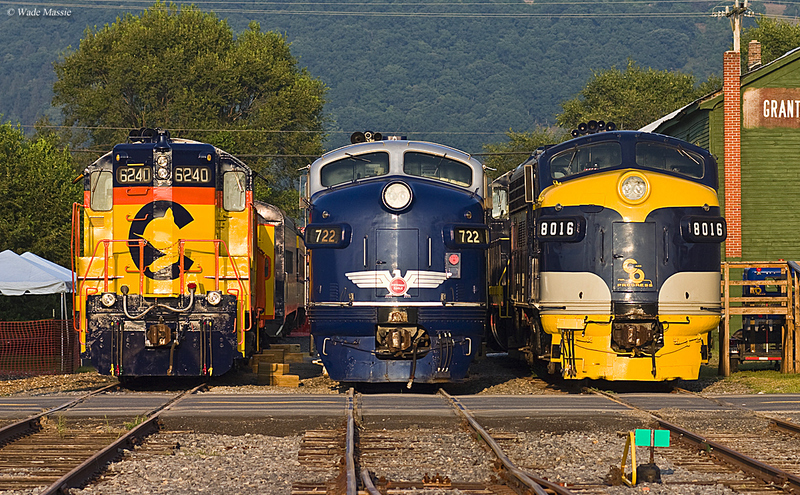 It should be noted that the Potomac Eagle Scenic operates over a line owned and maintained by the State of West Virginia, which also hosts freight service, known as the South Branch Valley Railroad. The little South Branch Valley Railroad (SBVR) is a shortline operating on a former B&O branch line in the Eastern Panhandle of West Virginia and is headquartered in Petersburg. 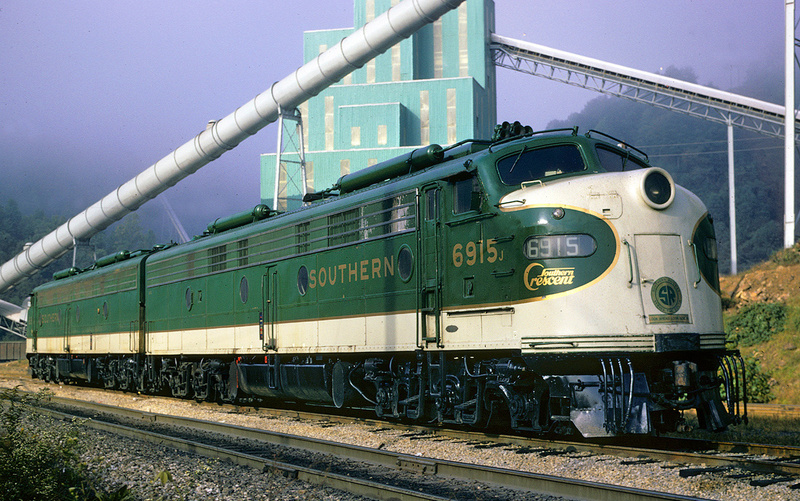 The SBVR was started in the late 1970s when the Chessie System (predecessor to today’s CSX Transportation) was interested in selling off the line. Realizing the potential the branch still carried in terms of business as well as its economic impact on the region, West Virginia stepped in and purchased it. Once West Virginia purchased purchased the former B&O route it spent roughly $5 million on the line during its first ten years of service upgrading the route, which had been mostly neglected and given up for dead by Chessie System. Soon after doing so the state named the South Branch Valley Railroad as operator of the line making it the first, and one of the most profitable, operations ever attempted by a public entity. Today, when riding the Potomac Eagle Scenic Railroad, although you may not know it, the line now features nearly 26 miles of seamless, welded rail, which allows for a much smoother and gentler ride. For power the Potomac Eagle typically employs four EMD locomotives (all of which also occasionally pull double-duty hauling freight trains when excursions aren't operating making for the quite the photogenic for rail historians and train enthusiasts as B&O, C&O, and Chessie System-painted locomotives lead the way). 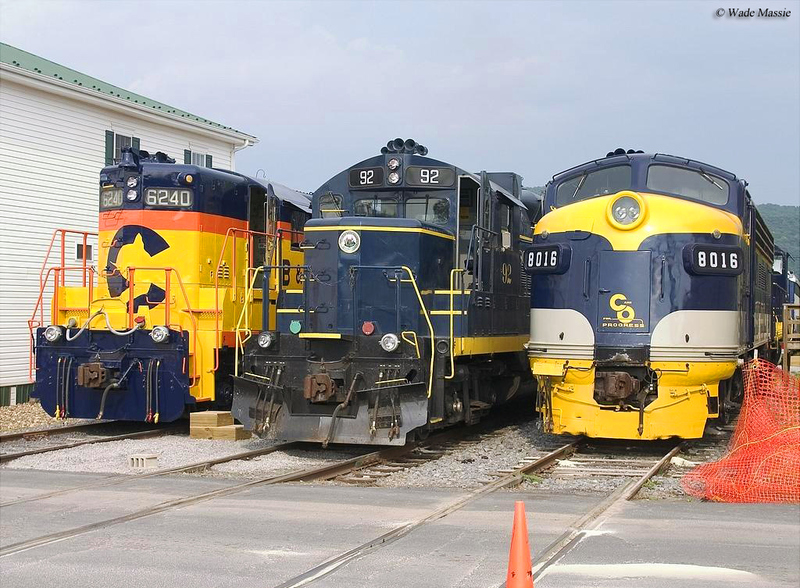 ·	Baltimore & Ohio GP9 #6604: Painted in original B&O passenger livery. 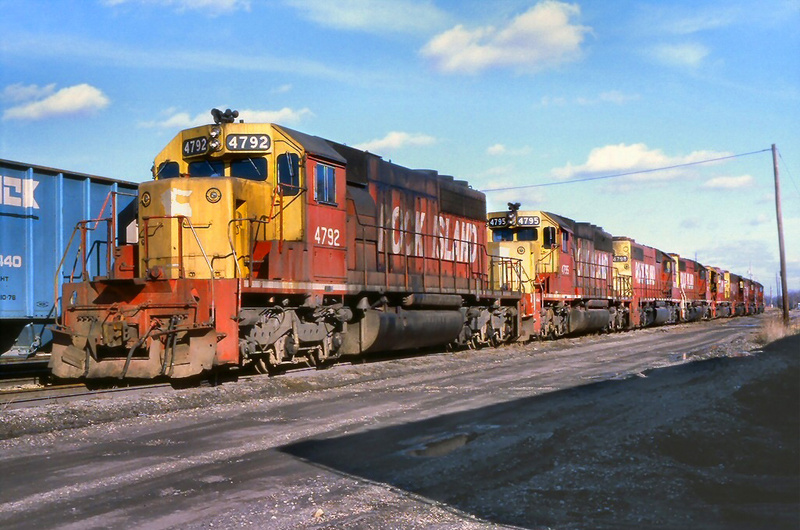 ·	Chessie System GP9 #6240: Painted in original Chessie System livery. 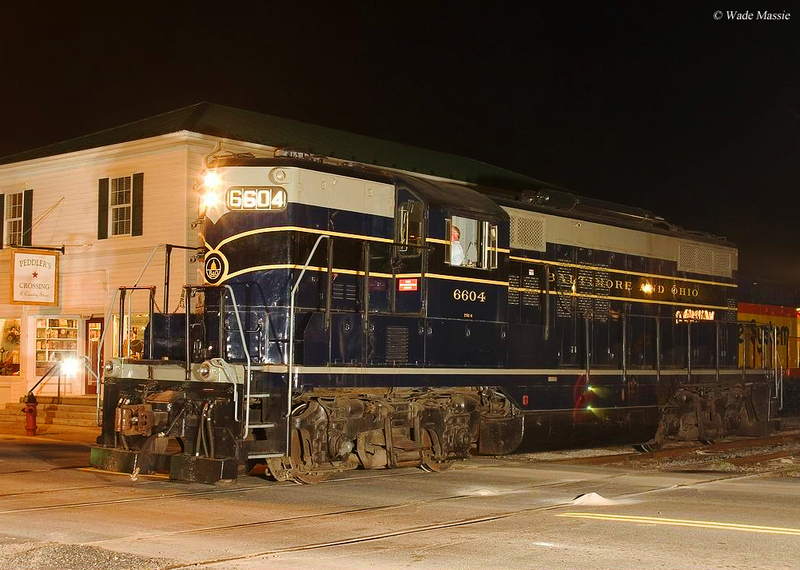 ·	Chesapeake & Ohio F3Au #8016: Painted in original C&O passenger livery although originally owned by the Clinchfield Railroad. 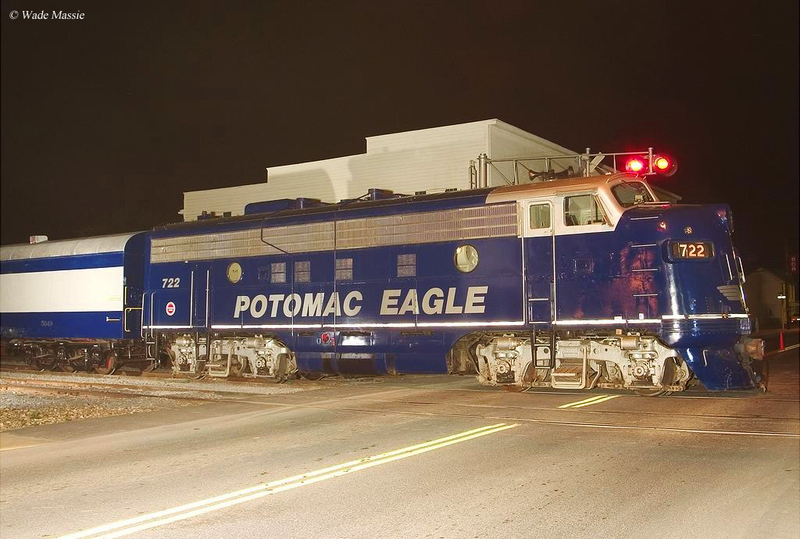 ·	Potomac Eagle F7A #722: Painted in Potomac Eagle Scenic colors and originally owned by the Bessemer & Lake Erie. If you're after a trip which offers spectacular scenery in a quiet, bucolic, location the Potomac Eagle Scenic Railroad is a must visit. 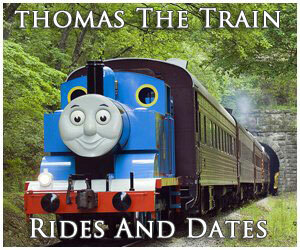 For more information about the Potomac Eagle Scenic Railroad please click here to visit their website. I would strongly recommend checking out their website if you are seriously considering a visit to Romney, as it offers everything you need to know such as calendar dates, available ride options, pricing, and much more. 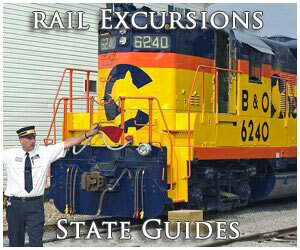 For more information about excursion trains like the Potomac Eagle Scenic Railroad you might want to consider the book Tourist Trains Guidebook, which is put together by the editors of Kalmbach Publishing's Trains magazine.